This collection of papers is dedicated to David Kendall (Professor of Mathematical Statistics in the University of Cambridge) on the occasion of his 65th birthday. 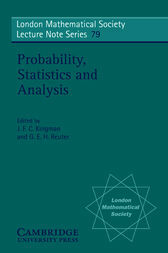 The content of the contributions indicates the breadth of his interests in mathematics and statistics, and the interrelation between mathematical analysis, the theory of probability, and mathematical statistics. The topics will interest postgraduate and research mathematicians.